Jung Hoon Lee 7d won the Rocky Mountain Fall Go Tournament on Saturday, October 1, which was held at the Highlands Ranch Public Library in Colorado. 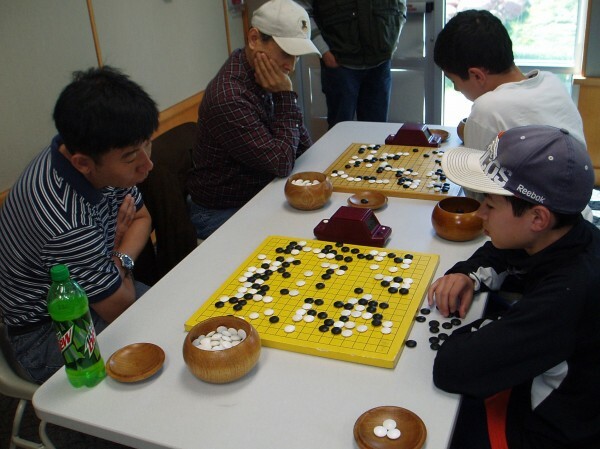 The 41 players ranged from 25 kyu to 7 dan.In the top section, Jerry Mao 7d took 2nd place. In the dan/single-digit-kyu group, Michael Wanek 3d took 1st place, George Angelos 8k was 2nd, and and Larry LeJeune 3k was 3rd. In the double-digit-kyu section, Hannah Jung 17k was 1st, Abby Cupec 25k was 2nd, and Alan Newman 25k was 3rd. Both Cupec and Newman were playing in their first tournaments. “The Springs Go Club donated money for the tournament prizes in memory of their long time member Leonard Kane who passed away last week,” reports organizer David Weiss.